There have many “first dogs” who’ve wandered the hallways of the White House over the years, but you may not know that the first “First Dog” to garner regular newspaper coverage in the United State was a dog from Toledo. It was during the administration of President Warren G. Harding of Ohio. In the spring of 1921, the Hardings received a seven-month old Airedale from Charles Quetschke, Harding supporter in Toledo. The Harding’s named the dog Laddie Boy and with no child of their own, this loveable Airedale would soon become treated like a member of the family. 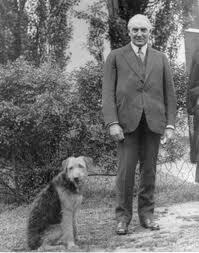 Both Harding and his wife Florence shared a love of animals and the First Lady, also an advocate for the care of abused and neglected animals, soon began employing this handsome dog as a poster “child” for the national promotion of animal rights issues. It soon made Laddie Boy the first presidential dog with a national identity. He was a very important dog, allowed to roam the White House grounds, attend meetings with the President and was even given his own custom-made Cabinet chair. President Harding himself would take the time to write letters to children on Laddie’s behalf. Within months, this young dog from Toledo, Ohio became the most celebrated dog in the nation. Children across the country loved Laddies and on July 26th each year, he was given White House birthday parties at which other neighborhood dogs were invited to join. known Airedale Champion Tintern Tip Top, owned by Charles Quetschke of Toledo. Quetschke was a man of some interest in the area, having led a bit of an adventurous lifestyle over the years as a boxer, sports promoter, motorcyle racer and champion dancer. He is credited with being the man who started the Toledo Kennel Club and the Maumee River Yacht Club. The legend and life of Laddie Boy, however began to change when Warren Harding took ill while visiting San Francisco in August 1923. As Harding lay on his death bed, it was reported that Laddie Boy, back at the White House, could sense his master’s impending death and howled constantly for three days before Harding passed away. When Florence Harding eventually left Washington to return home to Marion Ohio, the Smithsonian Institution reports that she gave Laddie Boy to Harry Barker, the Secret Service agent who had been assigned to protect her, and that Laddie Boy soon found a new life and home with the Barker family in Newtonville, Massachusetts. 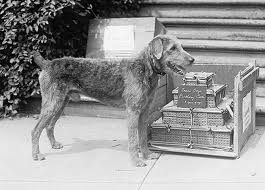 Laddie Boy, however did not vanish into oblivion, but was recognized by thousands of newsboys around the country who each donated a penny for a memorial to Harding and his faithful canine companion. The pennies were melted down and cast into a life-size sculpture of Laddie Boy. Today, that sculpture resides at the Smithsonian Institution’s National Museum of American History, but we are told it is not on display. 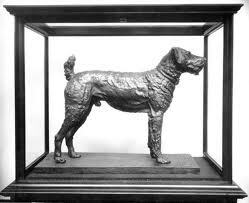 Maybe, (this author’s opinion), it is time to bring the sculpture back to Toledo, the birthplace of this most celebrated Presidential pet. A side note to that idea, is that in a 1992 Toledo Blade column by Mike Tressler, he wrote that when Laddie was given up by Florence Harding to her favorite Secret Service agent back in 1923, kennel owner Charles Quetschke of Toledo, who gave the dog to the Hardings, “begged” to have Laddie returned to Toledo, but to no avail. Laddie Boy passed away on January 22, 1929. The New York Times ran a story the next day, describing the terrier as “magnificent,” and reported that the “end came after the dog had been ailing for many months of old age, and died while resting his head on the arms of Mrs. Barker.” Laddie Boy was buried at an undisclosed location in Newtonville, Massachsetts. In a stange footnote followup to this story, earlier this summer in Marion at the Harding historic home, the custom made gold collar of Laddie Boy was stolen, it was apparently the only item taken in break-in at the Harding Home and Museum in Marion. A groundskeeper back in June arrived one morning and found a ladder leaning against the home and a second story window had been pried open. Many of the rooms were in disarray, but nothing else was missing except the treasured collar. 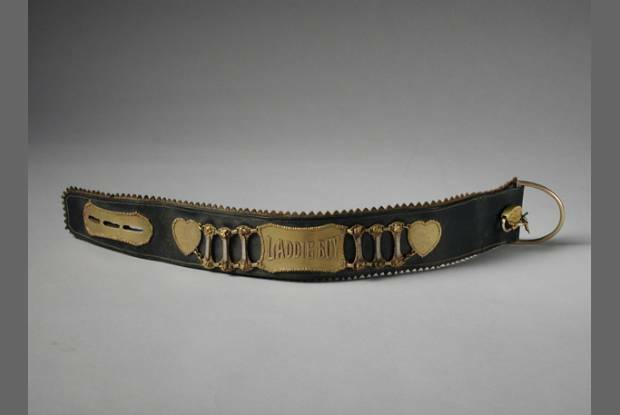 Marion Police distributed photos of the collar that had been made from Alaskan gold nuggets and the name “Laddie Boy” was written in raised letters on the center. So far it has not been found. Thanks Linda. Look for more in the future. I’ve been busy with some other projects and quite frankly have not posted as often as I should, but that should change soon. Wish you were still on the air Lou, we miss you and your grate stories. Actually I am doing some radio news work these days…for 107.7, the Wolf, as their morning news anchor. Also I have a TV documentary coming up on WGTE TV this fall, October 18th. “Romancing the River, a Maumee Love Story” is an hour long chronicle of the “Fort to Port” canoe trip that I did last year with Steve Pollick from the Blade and two others. We paddled from Fort Wayne to Toledo on the Maumee River–and the program will highlight the journey, including the river’s history, environmetal challenges and its natural beauty and wildflife. Nicely written story. Thank you.